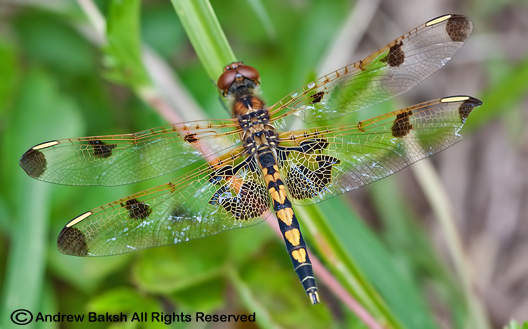 I think this is a Female Calico Pennant. 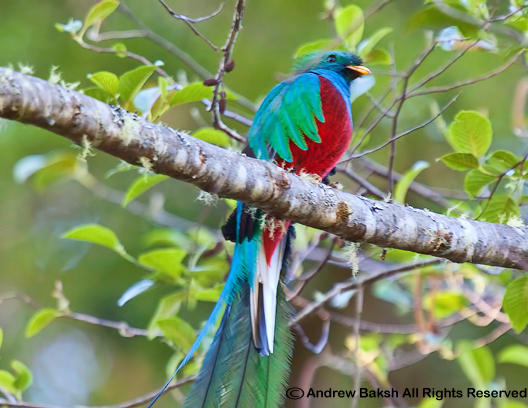 The males show red in the body markings. 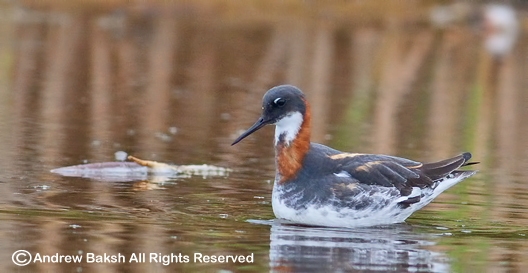 2 out of 3 Wilson's Phalaropes on the flats at Mecox LI. 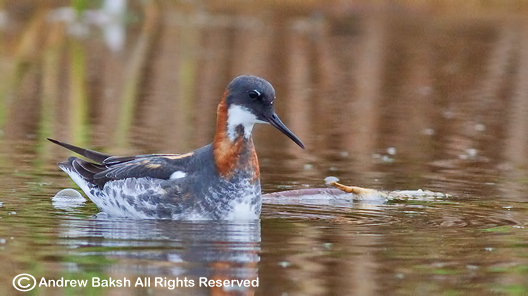 On June 9th, Heydi Lopes and I decided to make a run out to Mecox LI to get in on the Phalarope action. Action indeed in the form of 3 Wilson's and 1 Red-necked Phalarope. 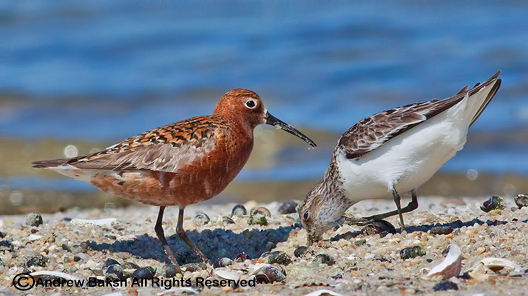 We are lucky down our way in Brooklyn and Queens, to see one Wilson's much less 3, add a Red-necked Phalarope (Phalaropus lobatus) and shorebird aficionados will understand why I was jumping out of my skin to see these birds. We were a bit wary as we arrived because the location is a private beach and they are pretty strict with outsiders, requiring a hefty parking fee, (should have take a photo of the exorbitant price) which I think, is designed to keep the less desirables like myself away. To my delight, no one was manning the booth and after parking we both got our gear and began scoping the flats. We quickly located the 3 Wilson's, but not the Red-necked Phalarope. Undaunted, I changed into shorts and water shoes to venture out onto the flats. I came to see shorebirds and distance looks were not going to cut it. 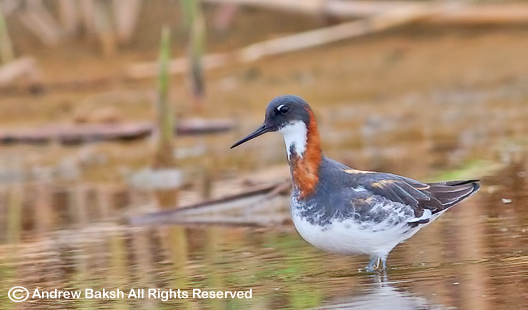 Shortly after venturing out onto the flats, we found the Red-necked Phalarope (Phalaropus lobatus) and it was a beauty, in nice breeding plumage. I was giddy with excitement and fired off a couple of shots as did Heydi. We both took up positions observing all of the Phalaropes and other shorebirds. 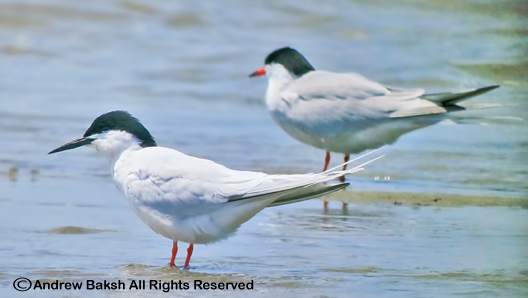 While looking at the Phalaropes, I noticed a flock of Laughing Gulls and Terns bathing near one of the spit. I began to scope the group out and had concluded that they were Laughing Gulls and Common Terns, when I noticed the legs of a bird whose body was completely hidden by Laughing Gulls. Somewhere in here is a Sandwich Tern - can you guess where? Not wanting to assume the identity of the hidden bird, I continued to work the area and changed my angle ever so slightly to get a better look. The bird raised its head and while I could only see the back I knew I was not looking at a Laughing Gull. Images of Terns began dancing in my head like a database query and I stopped at one...no, it could not be no...@$#%@$ way this was what I thought it was. Not saying anything as yet, I changed my angle again and the Tern turned slightly towards me and any doubts I had were removed when I saw the shaggy look to its head and all black bill with yellow tip. I said as casually as I could, "I think we have a Sandwich Tern (Sterna sandvicensis) here". Heydi immediately stopped her observation of the Phalaropes and turned her scope on the area to get on the bird, but I was taking no chances in case the bird took off and had her look in my scope. After a lengthy pause, Heydi nodded, but she was not seeing the bird well. So I let her get back on her scope. By then the Sandwich Tern (Sterna sandvicensis) was now a little more visible as the Laughing Gulls were moving around. Sandwich Tern found by Heydi Lopes and I at Mecox LI. 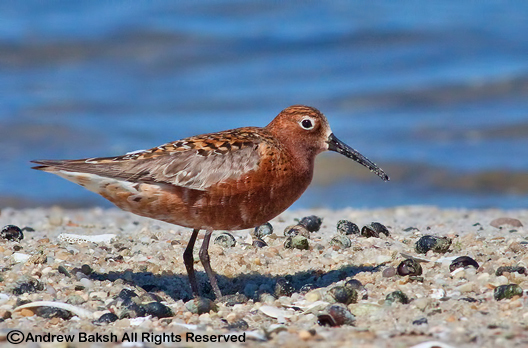 Today's guest post was written by Michael McBrien, the founder of the Curlew Sandpiper on June 14th, at Cupsogue Long Island. 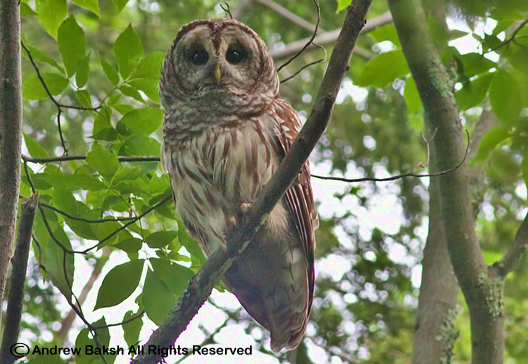 Michael, is currently serving as the vice president of the New York State Young Birders Club and has been involved with the group since 2009. In September, he will begin his junior year of high school. Michael has been interested in nature most of his life and shared how his mom remembers him getting up very early each morning when he was a toddler to watch a show called "Mother Nature" on Animal Planet which featured birds such as Common Loons and American Bitterns. Michael became interested in birds in the first grade when he did a science project on Ospreys. But credits a family birding trip to Hawk Mountain in Pennsylvania in 2003 as the moment when he became hooked on birding and has been avidly birding since. 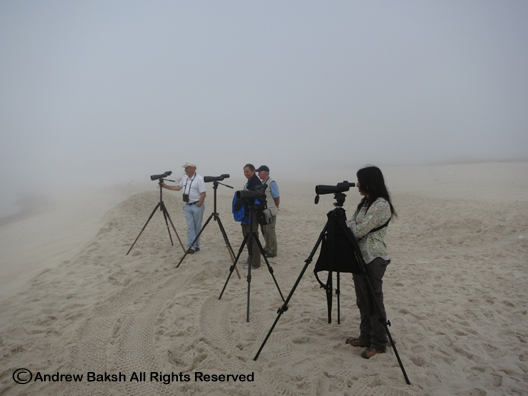 Michael enjoys all aspects of birding from watching seaducks on the coast during the winter, to studying terns and shorebirds in the summer, to observing songbird flocks throughout migration. However, he particularly enjoys birding during windblown rainstorms; something we both have in common! I first met Michael during a Nassau County Christmas Bird Count and it was obvious that he was a very focused young man on his birding. 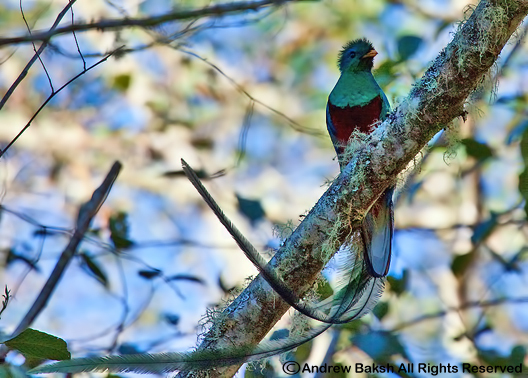 Besides his obvious skills as a birder, I am very impressed with Michael's humility through it all. He has always demonstrated to be a polite, humble (an important character trait) and grounded young man, which is a great credit to his upbringing!! 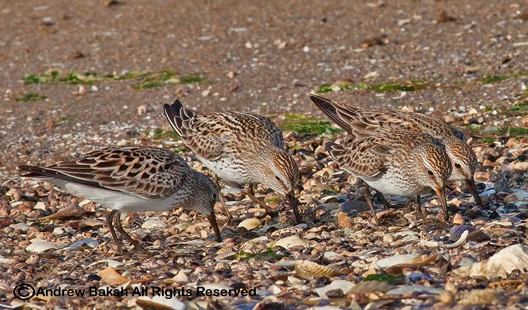 Here is his write-up on how the finding of the Curlew Sandpiper unfolded - enjoy! On, Thursday, June 14th, I (Michael McBrien), arrived at Cupsogue Long Island a bit after low tide. As I was walking out onto the flats, it seemed like it was going to be a fairly quiet day. 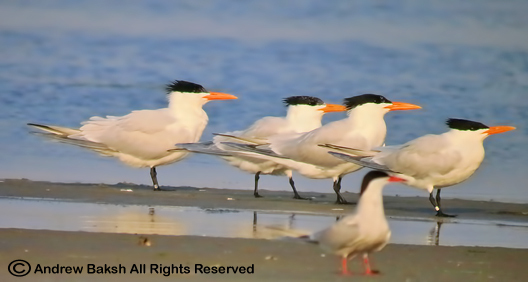 There was a stiff northeast breeze and very few terns were loafing about the flats. Although the number of Common Terns on the flats was low when I arrived, I decided to make the most of my visit and spent the remainder of my time out on the flats studying the lingering migrant shorebirds. 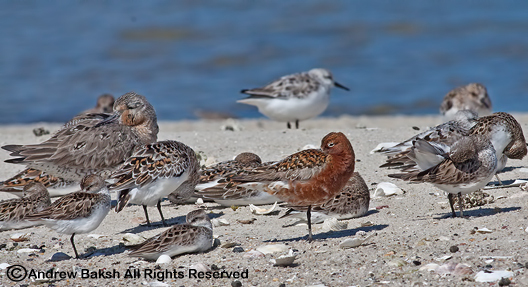 A good amount of Red Knots were present along with the usual Plovers, Dowitchers, and Peeps. Eventually, as the tide continued to rise, it came time for me to begin my trek back across the mudflats. 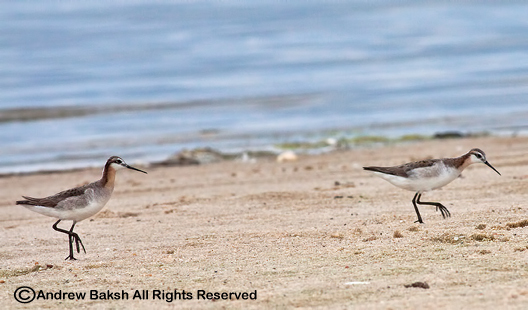 I packed away my camera and did a final scan of the shorebirds and terns, then started heading back. However, just before I was about to cross the first channel, I came across a small flock of shorebirds feeding in a mussel bed. Raising my binoculars, I quickly saw the flock included a couple more Red Knots (Calidris canutus), a Dunlin (Calidris alpina) and a few Semipalmated Sandpipers (Calidris pusilla ). 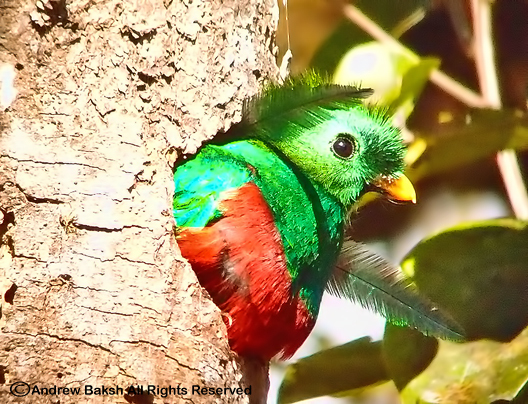 But then, I laid my eyes upon a different bird. From the naked eye, I had assumed it was a breeding plumaged knot, but a closer look revealed it to be something very different - a shorebird with extensive, brick red underparts, a long curved bill, and fairly long black legs. At first, I couldn't believe my eyes. But there I stood in the middle of a rising pool of water, in pure astonishment, with a beautiful adult male Curlew Sandpiper (Calidris ferruginea) standing before me. 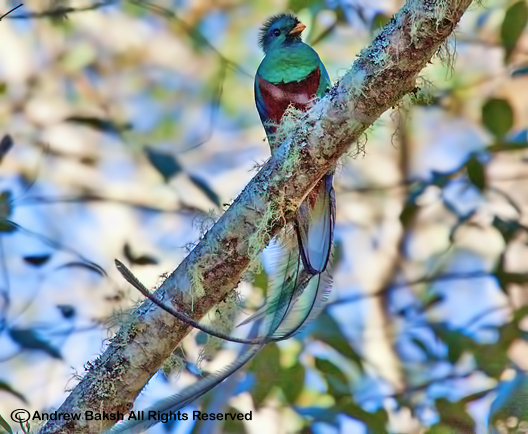 By now, I was hitting myself for putting my camera away earlier, but realizing the rarity of this bird, I carefully slid it out of my backpack, trying not to make any sudden movements. After I had taken a couple of shots, I called my mom and then a few other birders to alert them about this bird. After getting my mom on the bird, I stayed out a while longer studying it as the tide slowly washed away its feeding area. It eventually flew off to join a larger flock of Red Knots until they together flew off into the grasses surrounding one of the marsh islands. And now as I made my way back across the flooded marsh, I could only think of how privileged I was to have found this great bird, especially on a day that seemed pretty quiet when it began. 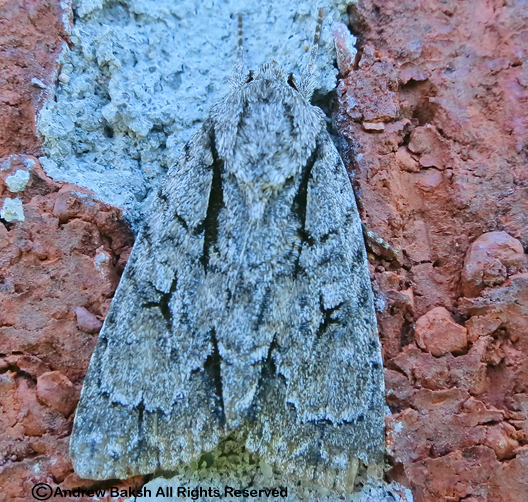 This all serves to show that when you're out birding, you never know what you may see. To quote someone I know, "you have to leave yourself open to the day." 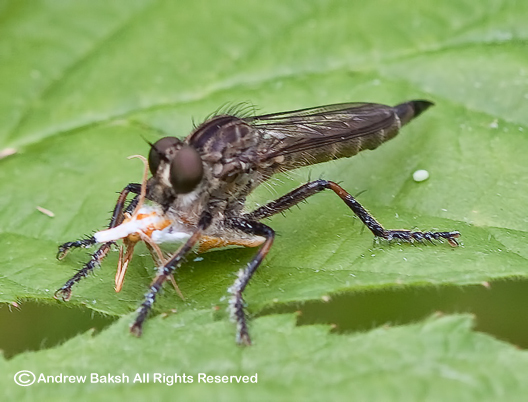 Curve-Lined Argyria (Vaxi auratella) Moth taken out by a Robber Fly. With all the buzz about warblers during the spring migration it is easy to forget that there are many other groups of birds that also migrate. 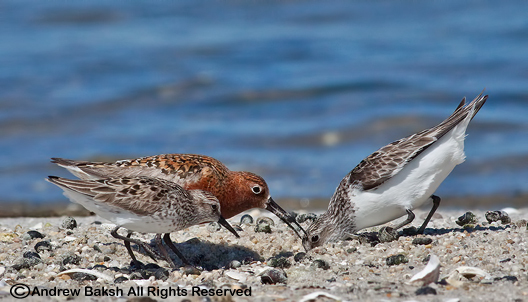 One such group happens to be my ABSOLUTE favorite - SHOREBIRDS. 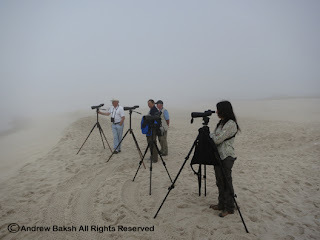 It is no coincidence that I participate in shorebird surveys for several organizations both in the spring and fall. 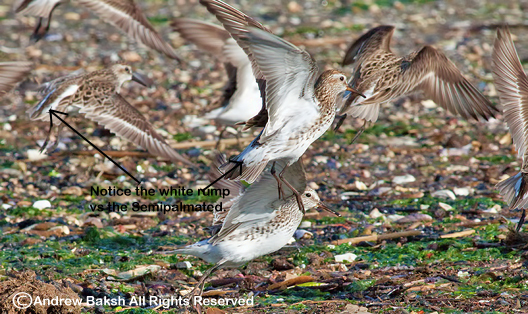 This post will feature one of those shorebird types that are moving through at the moment. White-rumped Sandpiper (Calidris fuscicollis). 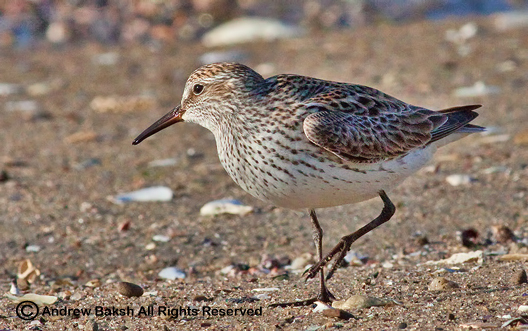 White-rumped Sandpiper, is a plain looking shorebird, that reminds me of a Baird's Sandpiper (Calidris bairdii) with their attenuated look and long wings projecting beyond their tail. 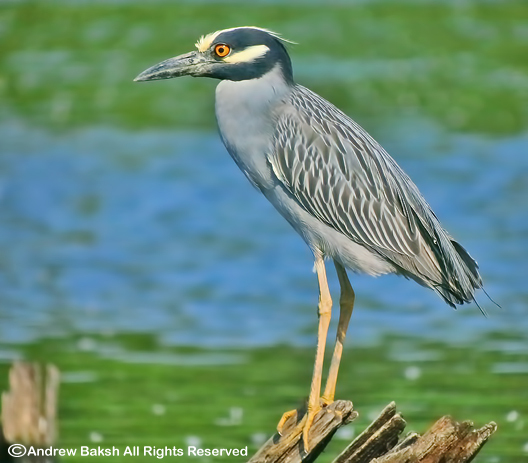 If all of the diagnostic features are present, then this bird could easily be identified among flocks of peeps. However, sometimes in the field birders may find it a bit tricky; especially, with those smaller White-rumpeds that will require patience to work through the field marks. Of course, if the bird calls, that would seal the ID with no problems. 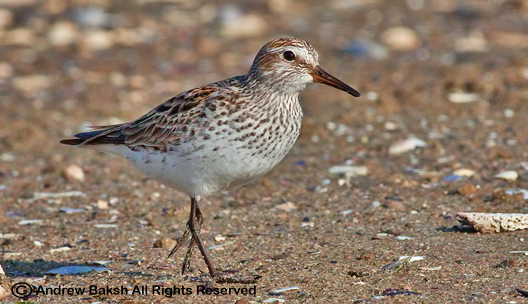 During migration, White-rumped Sandpipers are usually found on mudflats, flooded fields, marshes with shallow water, on the beach near mudflats or any similar types of habitats. 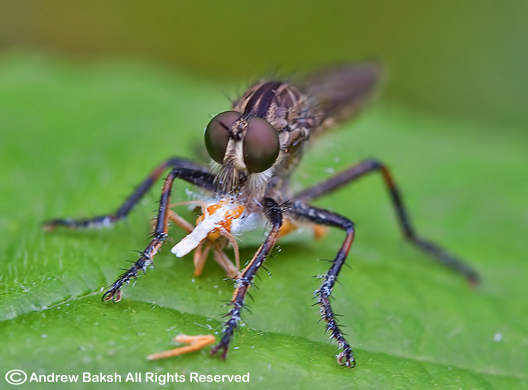 They typically forage near the water's edge or in shallow water mostly feeding on insect, insect larve, marine worms, mollusks, crustacean and other aquatic invertebrate. They have one of the longest migration routes, traveling over 6,000 thousand miles from the south of South America to their breeding grounds in the tundra. 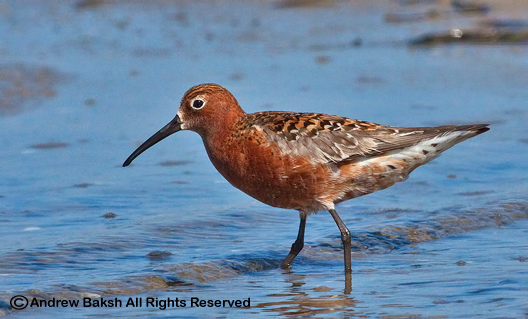 They make high-pitched, squeaky calls that are insect like; distinctive, once you get practice in hearing it among the calls of other shorebirds. Recently, I spent some time in the field on Long Island and in Queens observing these birds and I was able to capture video as well as obtain photographs, which I have included in this post below - enjoy!. Move along folks, nothing to see in the fog. Heydi Lopes and I were in Delaware on May 27th, chasing a breeding plumage Sabine’s Gull (Xema sabini) that was hanging around the Dupont Nature Center near Misipillion Harbor, when we picked up a report that my friend Shai Mitra, the ternmiester himself had found and photographed four Arctic Terns(Sterna paradisaea) at Cupsogue LI. 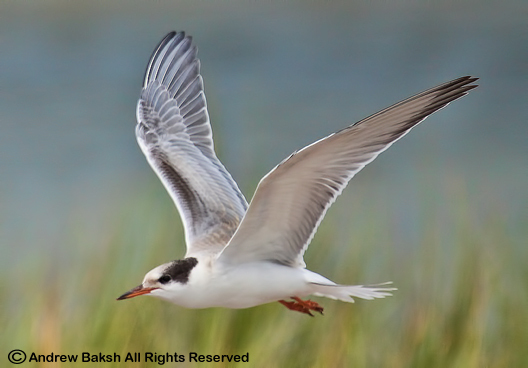 I was not surprised, an Arctic Tern had been found the previous day at Sandy Hook NJ by Scott Barnes and I had a gut feeling that they would show up on LI. After speaking with Shai and Tom Burke; Heydi and I discussed whether to try for Mississippi Kites (Ictinia mississippiensis) that had shown up at Sterling Forest or the Terns. We settled for the Terns since it was a life bird for Heydi. The morning began really slowly at Cupsogue LI, with heavy fog engulfing the ocean thus, making sea watching impossible. Out on the flats it was worse although some birders actually decided on wandering out on the flats. After giving up on the sea watch, Tom Burke, Gail Benson, Heydi and I began to scan the flats from the boardwalk and Tom very quickly picked up 2 fly by Whimbrels (Numenius phaeopus). Seeing that the fog had lifted slightly, I decided that it was time to explore the flats, so Heydi and I headed out. Before we could get onto the flats, I got a phone call from Tom indicating that he had received word that Michael McBrien who had ventured out onto the flats had found an adult Arctic Tern. This was excellent news!! We just had to get out there, so Heydi and I hurried, managing the tricky channels and made it onto the flats where we connected with the Arctic Tern (Thank you Michael!). Can you find the Arctic Tern in this photo? It was a life and state bird for Heydi who was happy despite being a little distracted at receiving reports of Brooklyn birds showing up that she needed for the year :) I was very pleased that we had gotten our target bird for the day and enjoyed studying the bird as it moved around with the Common Terns. We were then joined first by Tom Burke and Gail Benson and then later by Shai Mitra and Patricia Lindsay. 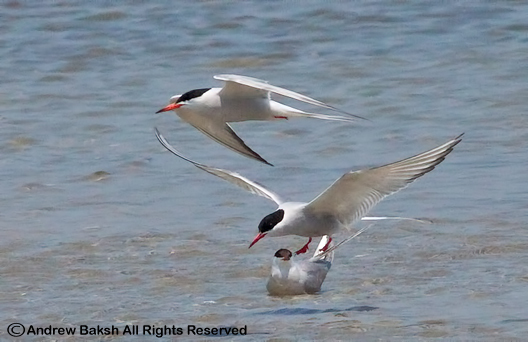 As if on cue, Shai upon arriving picked out a second adult Arctic Tern, which departed all too quickly for the ocean. However, the first Arctic Tern stuck around and we all got excellent looks and some of us managed photos. In addition to the Arctic Tern, we had really close up looks at Roseate Terns, a single Forster's Tern and a variety of shorebirds. Shai and I did the ritual of staying with the rising tide until the last possible moment (Heydi being a good sport stayed with us) hoping to add to our already good list of birds, but we were unable to top our already excellent sightings. We eventually made it back to the boardwalk where we joined the others and imbibed in a few celebratory drinks. Some of us stayed around for an afternoon sea watch, which was not too productive save for a couple of Sooty Shearwaters. We all soon parted ways trying to beat the holiday weekend traffic; Heydi and I continued birding out on the Island of Long, adding several good birds to an already impressive day list and wrapping up a good weekend of birding! 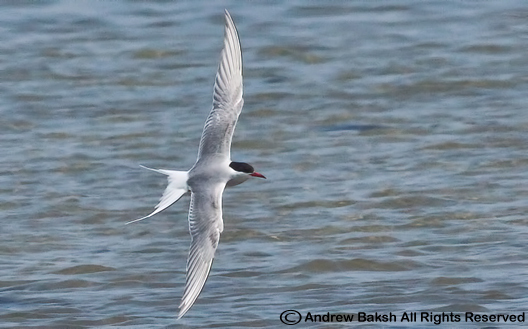 Here are some additional photos of the adult Arctic Tern we enjoyed at Cupsogue LI. 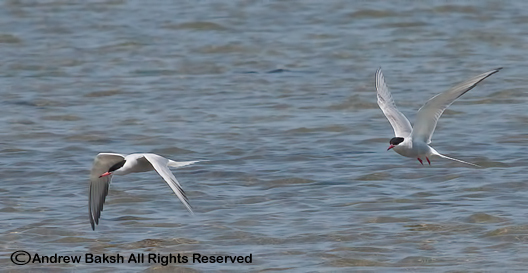 Nice close comparison of a Common and Arctic Tern in flight.